I always see lots of posts about starting blogs or things people learn once they've got their blog up and running so I put together 5 things they don't tell you about blogging. Blogger Jealousy - Yes it is a thing and I will happily admit that I have had it (and I probably still do) - I can set the scene ... you've been around longer than other bloggers but they're getting more comments than you, or their blog is getting more views - even though your doing everything you can to promote your blog. You get jealous of the way they take their photos and jealous of their new blog design ... we've all been there. It's not a bad thing. Everything takes time to flourish. Is it Bloggable? - So one thing I've noticed when I go anywhere now - whether its out shopping or when I'm out at a restaurant or even at the cinema - all I think about is 'can I blog about this' - it can getting a tad annoying sometimes but I'm still in that honeymoon phase of blogging (even though it's been nearly a year) and so I do blog about anything and everything I do - which is one of the reasons I started in the first place. Pictures, Pictures, Pictures - Whenever I have to take pictures for my blog I really enjoy it. Depending on the time of day - I set up my light box, clean the surface I'm taking pictures on and put on some loud music and get my camera ready. Then I snap, snap, snap, snap, snap ... until I can snap no more. So after about 1000 pictures are taken ... I find the 4 that I like ... yes normally out of the hundreds that I take ... I find about 4 I like. This can be tedious sometimes as I like them to be perfect. Social Media - Not necessarily a bad thing but over the past year I have not been absent from social media - there isn't a day goes by that I'm not on Twitter, or Facebook or Pinterest - it can be annoying to friends when they're trying to talk to you and you're engrossed in a Twitter debate about what the best blogging platform is. 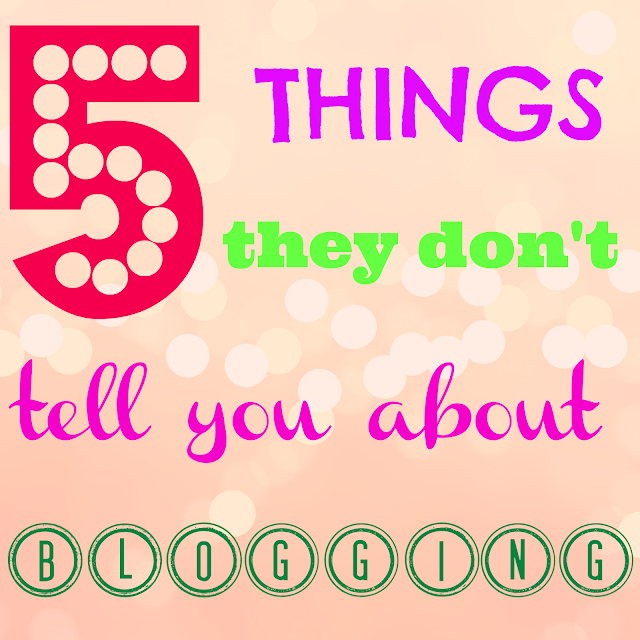 So that's 5 things I think that I never knew when I started blogging or that no one mentioned. Let me know in the comments if you agree/disagree?